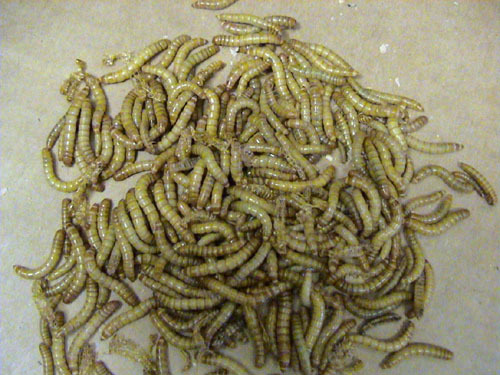 Wormman's mealworms are fresh and lively! Do you need help breeding mealworms? Check out our links to your right that show you step by step how to breed mealworms. Mealworm breeding is easy with our Mealworm Breeding Kit so that you will always be assured of free live mealworms. Thank you! Check out our mealworm breeding information. We ship our mealworms via USPS Priority Mail (postal service), which is an estimated delivery time of 2-3 days. The prices include the delivery fee! What you see is what you pay! 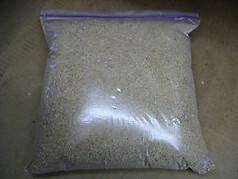 Mealworms are also called milworms, millworms, mealies, or meal worms. SMALL size mealworms are approximately 1/4" - 1/2"
MEDIUM size mealworms are approximately 1/2" -3/4"
LARGE size mealworms are approximately 3/4" - 1"
(*Note: The prices of our LARGE mealworms are higher due to more expenses required to raise and ship them. Postal prices have once again increased, and the weight of LARGE mealworms is heavier than SMALL and MEDIUM.